Getting ready for the holidays? Well you can start with buying vouchers for the traditional fruitcake or a delightful nutty walnut pie. 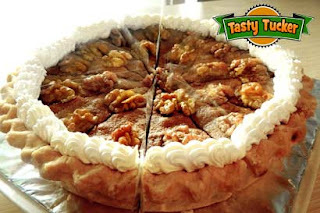 Choose any of Special Christams Fruitcake or 8-inch Walnut Pie Cake at Tasty Tuckers for PhP399 instead of PhP800, you’ll get a 50% discount. I grew up having those fruitcakes on our table which were mainly gifts to my Mom and Dad from their friend who frequent Binondo area. It is commonly served on our dining table during Christmas or New Year feast. 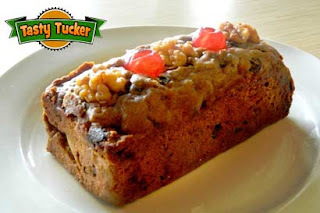 Fruitcake is a combination of dried fruits, candied fruits, nuts and spices with a little alcohol to extend its shelf life. Great for keeping your spirits high. Tasty Tuckers’ fruitcakes are made of the finest dried and candied fruits, nuts and spices. Well you can also choose a walnut pie for a change. This pie is loaded with nuts and with a subtle taste of sweetness that you’ll keep on coming back for more. Perfect for tea or coffee. You have two flavors to choose from or you can get the two if you buy 2 vouchers.